Lid & IML punching machine produces automatically various lids and IMLs from printed or unprinted flexible packaging materials. The lids and IMLs produced by these machines are used for container, bottle, cup and etc. of food and drink such as yogurt, milk, cheese, juice, tea, coffee, instant noodle, water, beer and etc. Lid & IML punching machine can punch not only aluminum foil but also PE, PP, PET and laminates. The punching tool is customized for minimizing the scrap and can be used for a long time. 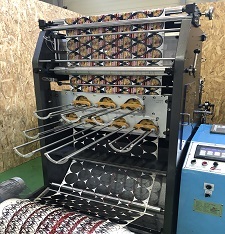 Lid punching machine can install embossing unit. The embossing unit's maximum width is 550mm. It consists of 2 steel rollers(male-female structure) and embossing pattern is made according to customer's needs. Copyright(c) PACKERS Co. ALL RIGHT RESERVED.